What is the advantage of using a strategy based on intermittent fasting versus simple dietary changes alone – such as the LowCarb HighFat diets that we prefer? There are several good ones. When I started out my clinic, I tried to persuade people to adopt the LCHF diet. I was doing this for people of all ages, of all nationalities. It is difficult enough for a well educated English speaking, computer literate person to adopt a strict LCHF diet. This is hard given all the conflicting advice flying around the internet and the airwaves. We would tell people to go Low Carb and find food diaries full of whole wheat bread and plates of pasta. Many people honestly did not understand the diet at all. I spent lots of time and grey hair trying to change their diets, but many people simply did not understand. Furthermore, their diets had not significantly changed in 40 years, and they were having a lot of trouble changing it. Since the Low Fat approach had been indoctrinated into them for the last 20 years, it was hard for people to understand how to eat a diet high in natural fats, rather than the low fat fare they were used to. Using a completely different approach such as fasting was much easier for people to understand. Fasting itself, is so simple that it can be explained in two sentences. Eat nothing including sugars or sweeteners. Drink water, tea, coffee or bone broth. That’s it. Even with this simple method, we (Megan, not actually me anymore) spend hours explaining ‘how to’ fast. 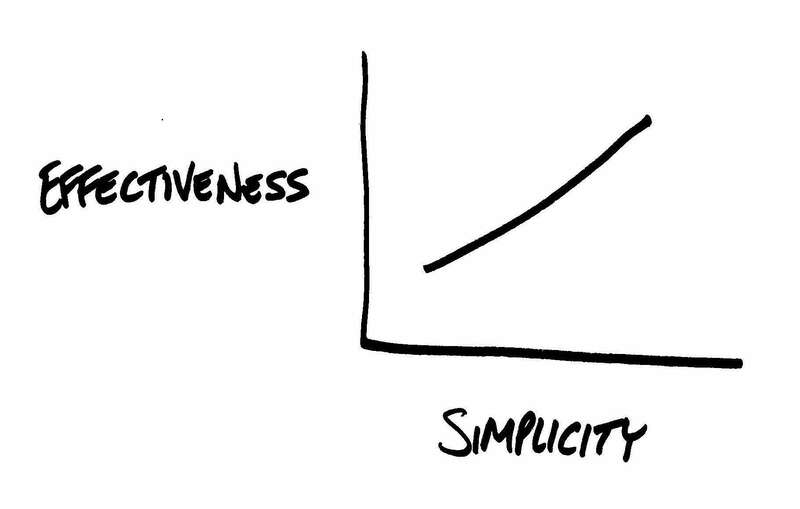 The most obvious benefit to simplicity, though is demonstrated by the startlingly simple graph above. The simpler, the more effective. Amen. While I may prefer patients to eat organic, local grass fed beef and avoid the white bread and processed foods, the truth is that these foods are often 10 times the cost. Some people, simply put, cannot afford to eat that well. This is due to the distorting effect of government subsidies on cost of food. Since grains enjoy substantial government subsidies, it is far cheaper to make something out of flour than whole foods. This means that fresh cherries cost $6.99/ pound and an entire loaf of bread will cost $1.99. Feeding a family on a budget is a lot easier when you buy pasta and white bread. But that does not mean they should be doomed to a lifetime of type 2 diabetes and disability. Fasting is free. Actually, it is not simply free, but it actually saves people money because you do not need to buy any food. While I may advise people to always eat a home cooked, prepared-from-scratch meal, there are many people who simply do not have the time or inclination to do so. 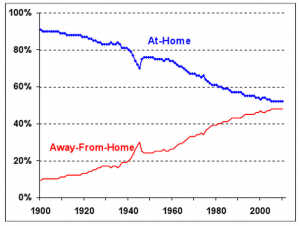 The number of meals eaten away from home has been increasing over the past few decades. While there are many who try to support the ‘slow food’ movement, it is clear that they are fighting a losing battle. Don’t get me wrong, I love cooking as much as the next guy. But it just takes a lot of time. Between work, writing, and taking my kids to school stuff and hockey, it just doesn’t leave a lot of time. So asking people to devote themselves to home cooking, as noble as it may be, is not going to be a winning strategy. Fasting, on the other hand is the opposite. You save time because there is no time spent buying food, preparing, cooking and cleaning up. It is a way to simplify your life. I often skip breakfast in the mornings. Man, the time saved! I often skip lunch, too. Man, the time saved! If time is money…. While I might advise people to never, ever again eat ice cream, I don’t think that is actually very practical advice. Sure, you might be able to swear off of it for 6 months, or 1 year, but for life? And would you really want to? Think about it. Think about the joy that some people get from savouring an especially delicious dessert at a wedding feast. Do we need to deny ourselves that little bit of pleasure forever? Let us all enjoy our birthday salad feast! Thanksgiving kale festival! All you can eat brussel sprouts! Yes, life just got a little less sparkly. Forever is a long time. Now, I am not saying that you can eat dessert every single day, but fasting gives you the ability to occasionally enjoy that dessert because if you feast, you can balance the scale by fasting. It is, after all, the cycle of life. 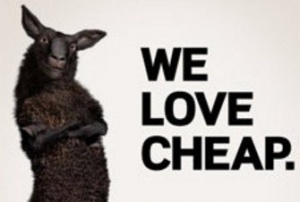 The reason these ‘cheat’ days are important is because it builds compliance. Simply put, it makes the diet easier to follow and changes it into a lifestyle instead. We often counsel that the most important aspect of fasting is to fit it into your life. I often treat type 2 diabetic patients. Most of them have had it for 10 years or more. So, of the obese patients I treat, they are often the worst of the worst in terms of obesity and insulin resistance. Sometimes, even a strict LCHF diet is not strong enough. The fastest and most efficient way to lower insulin is intermittent fasting. In the end, you must ask yourself this question. If you do not eat anything for 1 week, do you think you will lose weight? Even a child understands that you must lose weight. It is almost inevitable. So its efficacy is unquestioned. There are only two remaining questions. First – is it unhealthy? On the contrary, there are extraordinary health benefits. Two – can you do it? Well, if you never try it, you will never know. I think almost everybody can do it. Fasting can be done at any time and in any place. Furthermore, if you do not feel well for any reason, you simply stop. It is entirely reversible within minutes. Consider bariatric surgery (stomach stapling). These surgeries are done so that people can fast for prolonged periods of time. And they tend to work, at least in the short term. But these surgeries have tons of complications, almost all of which are irreversible. Furthermore, why would we assume that somebody cannot fast for 1 week or 1 month without ever having tried it? Here is the biggest advantage of all. Fasting can be added to any diet. That is because fasting is not something you do, but something you do not do. It is subtraction rather than addition. You don’t eat meat? You can still fast. You don’t eat wheat? You can still fast. You have a nut allergy? You can still fast. You don’t have time? You can still fast. You don’t have money? You can still fast. You are travelling all the time? You can still fast. You don’t cook? You can still fast. You are 80 years old? You can still fast. You have problems with chewing or swallowing? You can still fast. What could possibly be simpler? Thanks for the reply, Dr Fung. I have to admit that I feel less hungry if I ate a low carb meal before the fast. A high carb meal before the fast does make it harder to fast as the hunger pangs and stomach growls are stronger. That’s just it, Sarah. intermittent fasting is just so much easier on a low carb high fat adequate protein diet. Because of the satiating effects of the protein and fat. Carbs raise blood glucose and insulin and when the glucose is used up, you’re going to feel some hunger until the insulin comes down and fat burning takes over. IF may be as effective no matter what diet you are following, but it is much much easier with LCHF. But, as Dr. Fung pointed out, it does allow for the occasional higher carb “cheat” meal. 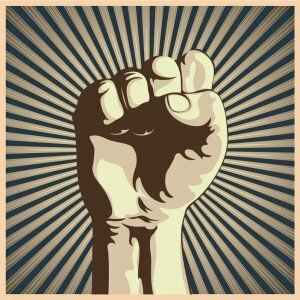 Love the Art Deco Fist- keep up the good articles Jason! I do wonder though, between 8-10 hours into a fasting day, I get very cold fingers and toes. Also, my pulse goes down a bit. It does generally go away if I drink something hot. Will it eventually go away for good? I’ve only been doing this for about a month. If its because of the metabolism slowing, how about if I do some exercise when I feel cold, like climb stairs, sit ups, etc? Will that prevent the slowing of the metabolism? I should add, according to my scale, I am not losing weight either. How can this be? If my REE dropped to 650, wouldn’t I be hospitalized or…worse? Would subcutaneous adipose tissue blood flow be at all involved with the cold extremities? I am very glad that I was able to lower the blood 300 to 165 in nearly two months of low carb & fasting.. with out any medication.. I been taking more than 100 of insulin a day..as a medicine.. i would like to thank you a god bless you. Thanks, JW and Donny. Will try it. Dr. Fung: I do appreciate you pragmatic attitude. I really like this post, while a low insulin load nutrient dense paleoesque diet is great fasting is simple and cheap! Peanuts soaked in vinegar, now I haven’t heard that one before. I must admit I have been scared off peanuts by Paleos, Rosedale etc, but you are right they are very cheap and if you buy them shelled it would keep the hands busy and eating slow. that fasting is a secondary option based on the difficulties some people have following or understanding LCHF except in the extreme cases you mention in #5 where both may be the best solution? I believe he means that fasting is the best possible intervention, but since we have to eat, he believes LCHF diets are the best possible diet for most people, or at least type-2 diabetics. Joanne, what do you eat when you come off a longer fast? I’ve done multiple 3 day fasts, and always have problems after the fast. Basically, there’s nothing in me other than water. My system starts up again, and I have to go to the bathroom 5+ times the first day off the fast (I usually restart at lunch, since I’ve mainly given up on breakfasts). Do you eat a very small meal for the first meal? Do you try to eat lightly the first day? Great article Dr. Fung! No more excuses. I have a question: Would it be effective if I did a five days or more fast where I eat 500 or less calories per day? USC’s Dr. Valter Longo has created the Fast Mimicking Diet, a five day partial eating diet that in research decreased risk factors/biomarkers for aging, diabetes, cardiovascular disease, and cancer without major adverse effects, providing support for the use of FMDs to promote healthspan. But Bernard, what you’ll notice if you read Dr Fung’s book, what he calls a 24 hr fast is really 23.5 hrs or 21+3 hrs. In other words one meal a day is considered a 24hr fast, assuming that meal doesn’t extend for say 6 hrs. Rather than an alternating day 24 hr fast I do a continuous 24 hr fast and have a supper void of sugars or simple carbs. Calories don’t cause obesity, insulin does. Personally, I’d call what I am doing a continuous 23hr fast but Dr Fung coined it, I didn’t. Thanks for another excellent post. I have found it hard to fast longer than 48 hours at a time, but will keep trying because I agree that the difficulty may be more psychological than real physical hunger. Howeve, even shorter fasts (16 hours every night and 24 hours three or four times each week) have worked well for me and this encourages me to keep trying longer fasts to find out how much more I can improve my health. WE ARE WHAT WE DO NOT EAT! thank you so much for making your knowledge so accessible via youtube and the internet. I am obese and not losing very much weight doing 16:8 and lchf. Last year I lost weight doing 5>2 and now it is so easy to understand why. Brillant! Give them Dr Eric Westman’s Ketogenic Diet Manual and tell them “only eat the food listed on page 4. If it’s not on page 4 you don’t eat it”. So break the suspense for us–what’s on page 4? Dr Fung, Just wondering if you have had any kidney transplant recipients fast to address T2DM / weight loss post transplant? Are there any contraindications for prolonged fasts in transplant recipients? Thanks for your wonderful blog, videos and other fasting related resources. These are truly invaluable. Best way to measure if your insulin level is low is the ketostick. If you are in ketosis, your insulin is low. AFAIK there is no home method for direct testing. Thanks Walter. I have been LCHF for 6 months so, unless there is something very wrong, I should be in ketosis but I never use the ketostix and have also heard that unless you are just starting out they are not reliable as a measure after a while. The breath tester is said to be more accurate. Do you happen to know why the insulin would be low if you are in ketosis…….especially as things eaten on LCHF can stimulate insulin but not increase your BS? Hi Jane, I am not sure that this is a definite answer but by my thinking, being in a state of ketosis means that you are burning your own stores of fat. If your insulin is elevated then fat storage not burning will occur, hence, no ketones. Just FYI, as I learned the hard way, Drink lots and lots of water…stay hydrated. Hope this helps. have you ever considered a slow metabolism beneficial from the perspective of aging:? I guess 99% of folks dont. If your body runs cooler and at a slower pace, it may run in maintenance mode for much longer that it would if you provide it with plenty of food and focus on “speeding up” your metabolism. folks, challenge the dogma! Very inspiring. What was your IF routine and how long did it take to shed the pounds? I’m trying to fast 2 days per week. I have breakfast and then don’t eat again until the next morning’s breakfast (twice per week). Am I doing it right?! You sure are! You’re doing a 24 hour fast twice a week. Whether dinner to dinner or breakfast to breakfast – whatever works for you. DebbieC, well done! was your 24-hour fast days in addition to the other days being 20:4? Dr.Fung what would you suggest for folks such as myself that experience a mental fogginess/drowsiness. It sort of a hard feeling to describe, I drink water but still tend to not feel right (mentally) when fasting (20-24 hrs). Have any of your patients experienced hair loss as a result of fasting? If so, why do you think this happens? Since fasting (and low carb diets) lowers insulin and insulin impacts rapidly dividing cells (such as in cancer) — wouldn’t such regimes possibly cause hair loss as hair follicles are rapidly dividing cells? I have been on LCHF for about two years. After reading Dr Fung’s blog, I have done 4 X 16/8 and 2 X 36 fasts. I am surprised in the lessening of my appetite. Some days I almost dont want dinner. However, I am also sleepier in the 2 weeks I have been on this protocol – could be coincidence. Just turned 60. Weight loss seems to have picked up again after stalling since late spring. Blood sugar after 36 hour fast was 4.2. (T2D) 2 hours after very low carb breakfast it’s 6.5. Discouraging. Or does that number mean anything? I see this was touched on earlier in this thread, so disregard unless you can add more specific info. @Grant: What does your “very low carb breakfast” look like? There are people who think they eat “very low carb” but they still eat bread and other crap T2’s shouldn’t be eating. Wondering anyone with T2 how long one can stay without eating. If I don’t eat after five hours my sugar goes down fast..may be up to 3.5 or so which makes me worried.How I can start fasting ? Hi Dr. Fung, please could you say a few words about what effect fasting can have on gallstones? The only research I could find seemed to say that fasting longer than about 14 hours started to make the gall in the gallbladder more viscose so more likely to worsen stones. As a tool against T2D would 14 hours fasting be long enough – or would taking possibly linseed oil every 10 hours or so be adequate to keep the fast going and keep the gall more fluid. Thank you. your posts are next to set my day just right. Your humour as you teach is really inspiring, and there is not a misplaced impartation anywhere. Thanks again. Any thoughts on taking BCAA’s (Branched Chain Amino Acids in pill form) on a fast day? Hi Dr. Fung. I am a newly diagnosed diabetic as of 9/26. (FBG 333, A1c 11.3) I was put on Janumet 50/500 2x. At the same time I started intermittent fasting by eating in a 6 hr window (low carb lunch and dinner) 7 days a week. I have lost 10 lbs in 30 days and my FBG is now a consistent 100. Will this fasting protocol eventually reverse my diabetes, or do I need to be on a more aggressive fast. Do I break the fast, if I drink my coffee with coconut oil in the morning? Or it is still counts as fasting hours?